**If you're ready to book now, please click the 'Request to Book' button. If you'd like a quote, please click on 'Send Message'. MOUNTAIN LOVE is the perfect place to enjoy the quiet sounds of nature, yet minutes to all the action Pigeon Forge has to offer! Deep in the heart of the Great Smoky Mountains, MOUNTAIN LOVE is located on Bluff Mountain, about 5 miles from downtown Pigeon Forge, approximately 8 miles from Dollywood and about 14 miles from Gatlinburg. It offers a loft king bedroom with a LCD flatscreen TV where you can enjoy the view of the treetops and all the privacy you need to celebrate your romantic getaway. 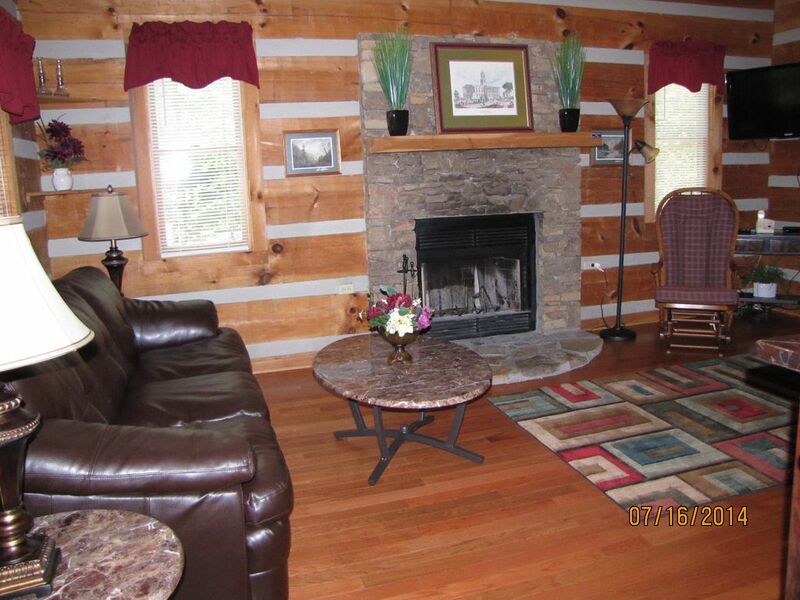 Sit back and relax in the hot tub on your private porch or warm your toes by the woodburning fireplace and cuddle up. MOUNTAIN LOVE is a true log cabin with all the comforts of home, including a fully equipped kitchen and flat screen tv in the great room. The feeling of being away from it all, and just enjoying being tucked away on Bluff Mountain in a serene park like setting is priceless! **If this cabin is booked for your desired dates, check out VRBO #368064, #369981, or #617953, they are all 1 Bedrooms just like Mountain Love in the same area. We love Bluff Mountain, where all of our cabins are located. This cabin is a great get away! The privacy of the mountains combined with being within minutes of Pigeon Forge makes it perfect! Woodburning in great room - we do not provide wood. The hot tub and jacuzzi did not work, we still made fun of what we had. The cabin was very Pleasant and CLEAN😊 Overall we had a Memorable time. Cute cabin, pretty convenient to town. We had a nice stay. Comfortable bed, nice hot tub, not too far from town. Great location, quiet and relaxing! Cabin was perfect! Easy to get to, and just minutes from everything in pigeon forge. We will definitely be visiting again! The cabin is very clean & perfect for mountin get away! The hot tub was awesome! The weather was below freezing so we didn’t get to enjoy hot tub as much as we wanted...but it was great! Perhaps notifying renters that there are no extra trash bags, paper towels, etc at cabin will be helpful. I would highly recommend cabin & have told several friends about it already!